Hilarystone.com is devoted to older classic and vintage race, road, track, lo-pro, time trial and touring bikes, frames and parts to fit. My main stock is lugged or fillet brazed steel frames, tig-welded ones and even aluminium and carbon-fibre frames too if I think they are interesting. And from most periods – as far back as the early 20th century though most of what I sell will be from the 1950s through to the 1980s. Please note I am closed on Wednesdays and Friday; there will also be times when I am away buying stock. I will endeavour to contact within 48 hours of your enquiry. FOR HOW TO BUY PLEASE click on the Contact page (and read it!) which explains how our business is run, payment methods, shipping and importantly our conditions of sale. Please note items returned under the Distance Selling Regulations which are not faulty or damaged will be subject to a 15% restocking fee. We are open Monday, Tuesday and Thursday 9.30 to 5.00 for telephone enquiries on 0797 104 3290. I will then send you an invoice with all the details you need in order to make a payment and complete the sale. I CANNOT take credit or debit cards directly. ONE FINAL POINT – once I have sent the invoice, the order is only valid for 24 hours unless it is paid or clear arrangements have been agreed. I have had several cases recently where somebody has ordered an item, and paid a week or so later expecting it to be still available. PLEASE NOTE that I can only value bicycles, frames or parts if photos are sent by email; there is a charge of £12. I can also research bikes and their makers – there is a minimum charge of £20 for this. I am always keen to buy new stock – bicycles, frames or parts of the type on this website ie older classic racing and lightweight but NOT roadsters, shoppers or carrier bikes. Please contact me via email in the first instance. 6th May Uploaded yesterday some lovely Stronglight chainsets and just now three pre-1970 frames – an intriguing and beautiful Geoffrey Butler road frame, a stunningly beautiful Frank Lipscombe and a 50s Flying Scot. 14th May Uploaded three modern frames – an Argos Randonneur/Sportive, an Australian built Blom 753 and a beautiful Barry Chick. 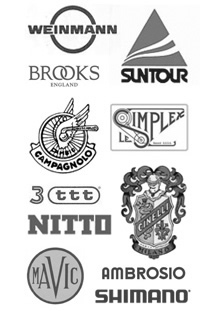 16th June Have uploaded Concor, Turbo and Rollssaddles, Cinelli, Milremo, 3TTT and ASrius saddle, triple chainsets, some pre-1970 pedals and just now a large number of Campag front gears. 16th July Just updated the Cinelli handlebars page – included there's a good selection of Giro D'Italia shape and a beautiful pair of 66 with 1R stem and Cinelli leather covering.